If there's one thing that I'm very self conscious about and always want to look the best, it's my eyebrows. Having dimension and a good shape to your brows frame your face, so of course they're important! I used to get them waxed at my hair salon every two to three weeks and tweeze in between when needed, but lately I've been tweezing them myself so that I can control and choose the shape I like, etc. I also like being able to control how the arch in my eyebrows appears. Tweezers can also be tricky - there could be a cute patterned set of two in Forever 21 but I hesitate in buying because I know that they aren't going to work all that great. 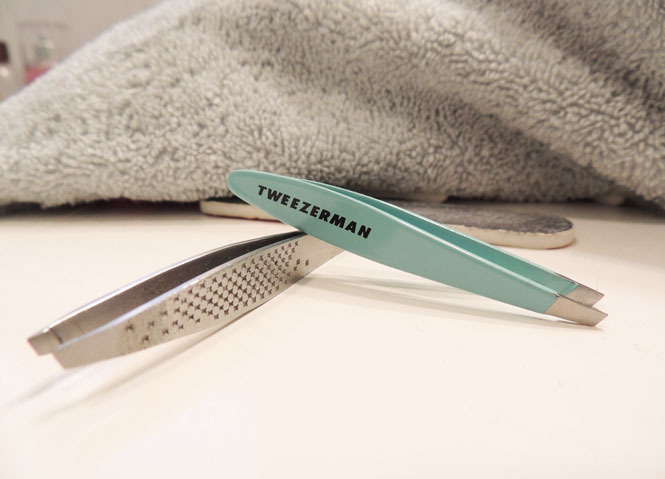 One brand I've found and loved is Tweezerman and they've worked like no other tweezers I've tried! But something my sister and I both always notice is that after a while of consistent use they tend to not work as well and it becomes harder to tweeze. Not thinking anything of it, we just ended up buying pair after pair - assuming that's how it had to be.. thankfully we were wrong! All you need is a nail file and the tweezers that need to be sharpened! Seriously, it's this easy! 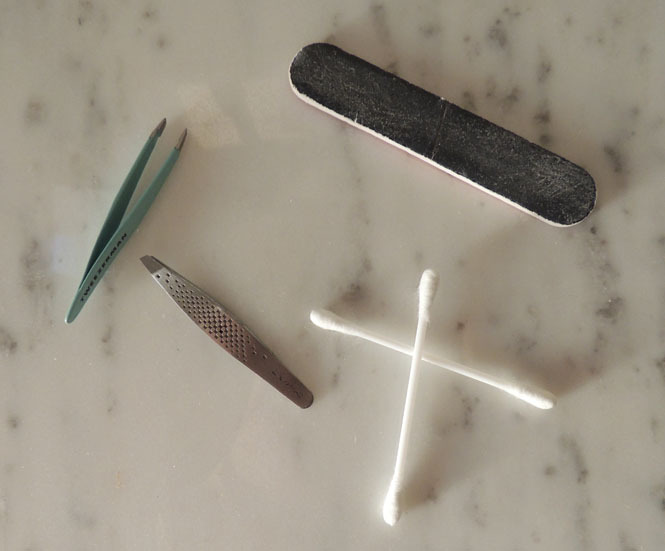 Put the sharp and pointy side of the tweezers on the nail filer and pretend as if you're "tweezing" the nail file - do this a couple of times and voila! You have tweezers that are as good as new! I've found that the more times you try this, the sharper and more useful the tweezers will be. I'm sure there's tons of ways to sharpen tweezers, like with sand paper (maybe?) 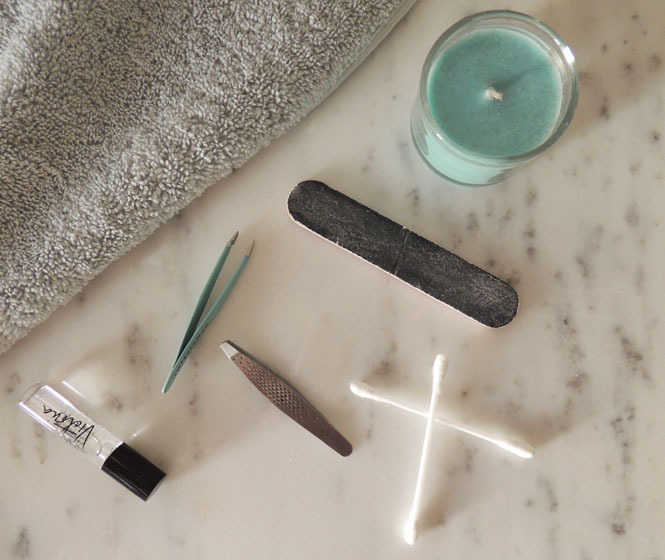 but using a nail file is so easy and it's definitely something that we all have laying around! I love this trick and I've now been going around looking through my vanity for other pairs of tweezers I have to sharpen. It's amazing the little things that make me so happy, but fixing an expensive pair of tweezers work like new again being nearly a year old is a big money saver and great if they're a pair of tweezers that you love and use every day. Next I'm going to try this on some of the cheaper pairs of tweezers I've bought but I would imagine that it won't work as well with not-as-sharp tweezers to begin with. There's so many different kinds of tweezers to choose from - precision, point, slant, the list is long and really depends on preference, hair thickness, etc. 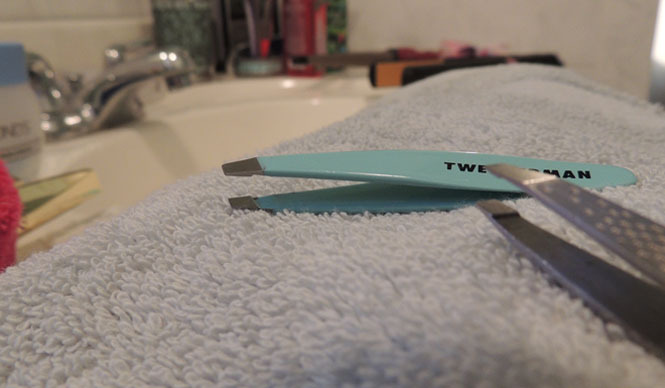 but having a great pair of tweezers you love is (in my opinion) so important! Rounded or flattened tipped tweezers usually aren't great for anyone, but may be good for someone who is just learning to use tweezers or just needs them for something simple. A simple way I've found to work to make your tweezers last even longer is to properly store them. I'm guilty of sometimes just throwing them in my makeup bag if I'm in a rush but think of tweezers as one of your most important makeup tools - they should be stored as such. Most Tweezerman tweezers come with a storage case which is great because it keeps them safe and doesn't take up much room at the same time. I hope that I saved you some time - and money! - before buying your next pair of tweezers! This has been so helpful for me and I can't believe I hadn't thought of it sooner or even have seen it anywhere sooner! I am all for fixing something to save money! I never broke my tweezers, but I will win this so that I can use it if I ever have a broken tweezers. Awesome hack! Thanks for the tip! I am all for saving a few extra $. I haven't broken tweezers but definitely have misplaced them before. Pretty awesome! I didn't know you could save tweezers this way. Thanks for sharing, it's definitely helpful! This is great! I have never heard of this before. I go through lots of tweezers. I need to try this. This is sooo simple and it just completely blew my mind. Why didn't I think of this?! Thank you for sharing! This is brilliant! Definitely have a few pairs that will be sharpened momentarily. Brilliant! I have always just tossed mine and bought anew pair. My kids keep ruining all my tweezers. My so uses them for his engineering projects! Amazing. Thanks for posting this! Amazing! I have no idea about this before, you're so smart. Thanks for sharing us useful tips. Say what?! Life changing! I had no idea this would sharpen them I just always avoid shopping for new ones because I hate picking a pair that I think will be good. I need to try this. I've got two pair of tweezers that no longer work well and are frustrating to use. I've never thought to do this before. Your green tweezer is very pretty. Thanks for these helpful tips I will have to try this with one of mine. I've never actually even thought of sharpening a tweezers, usually I just throw the bad ones away lol. Now ill have to try this instead! These are great tips. I don't just throw away my stuff. I'd like to try if I can repair them first. Thank you for this post, I have a few pair that need sharpening and didn't know how! Great tips! I never broke any. I have about 4 sets of tweezers. I do like that mint green color as well. I use my tweezers all the time for my brows. Wow! amazing. I had this problem just this morning and this really workd! Awesome hack! I have a few pair that need sharpening and didn't know how!